19 Results exactly matching the search phrase. 7 Results matching titles words. 7 Results matching title or description. The HDMI over single CAT5e/6/7 Receiver accepts uncompressed audio/video and IP data over a single run of CAT5e/6/7 cable for a distance of up to 100 meter. The HDMI over single CAT5e/6/7 Transmitter sends uncompressed audio/video and IP data over a single run of CAT5e/6/7 cable for a distance of up to 100 meter. The DVI to 3G SDI Converter allows DVI-D HD timing signals to be transmitted to an SDI display, or to a 3G SDI to DVI Converter using a co-axial cable. It is perfect for high bit-rate processing at 2.970 Gbit/s, ensuring fast signal speed without signal loss. Transmission distance can be 300m for SD-SDI, 200m for HD-SDI and 100m for 3G-SDI. 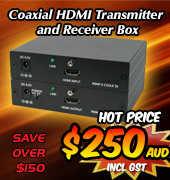 The Audio In connection allows the user to add a separate audio signal with the DVI video signal, all combined into one SDI video / audio output for co-axial line transmission. The 3G SDI to DVI Converter allows an SDI timing signal to be terminated from a DVI to 3G SDI Converter transmitting over a co-axial cable. 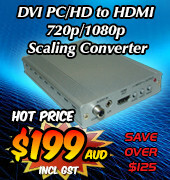 The converted SDI to DVI signal can then connect to a DVI monitor or device. It is perfect for high bit-rate processing at 2.970 Gbit/s, ensuring fast signal speed without signal loss. Transmission distance can be 300m for SD-SDI, 200m for HD-SDI and 100m for 3G-SDI. The Audio In connection allows the user to add a separate audio signal with the DVI video signal, all combined into one SDI video / audio output for co-axial line transmission. 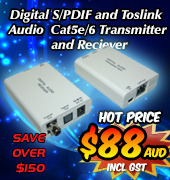 The HDBaseT-Lite HDMI over single CAT5e/6/7 Transmitter & Receiver with IR is another quality video and audio transmission product available from our on-line store. Designed to transport High Definition HDMI/DVI, 4Kx2K and 3D video and audio signals over CAT5e/6/7 cable for a distance upto 60m without signal loss or degradation. HDBaseT-Lite HDMI over single CAT5e/6/7 Transmitter and Receiver with IR Supports resolutions from VGA ~ WUXGA, HDMI SD/HD 480i/p ~ 1080i/p, 4Kx2K and all 3D formats. 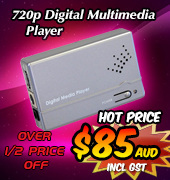 Uncompessed digital audio formats such as LPCM 7.1CH, Dolby TrueHD, Dolby Digital Plus and DTS-HD Master Audio are also supported for transmission with the video signal. The HDMI over CAT Cable Slimline Receiver w/ 48V PoH is designed to receive uncompressed UHD video and audio to a compatible Transmitter over a single Cat5e/6/7 cable, for a distance up to 100m. The HDMI over CAT5e/6/7 Wall Plate (Slimline) Transmitter and Receiver w/ 48V PoH set can send uncompressed audio/video along with controls, IP and USB data over a single run of CAT5e/6/7 cable up to 100m. The HDBaseT HDMI over CAT cable Receiver Scaler with LAN/RS-232/IR/Bidirectional PoE is designed to receive an incoming line signal up to 100m distance, convert and scale the signal and then output the new HDMI signal to the HDMI output port. A separate Optical digital audio output port provides for extension to an external sound system. Besides video and audio management, it also supports system control by panel-mount buttons, 2-way Infra-Red and RS-232 PC protocol. With bidirectional LAN serving and Power over Ethernet (PoE) functionality, installation can be made very flexible. ​The 4x4 HDMI Matrix UHD 6G with USB Line Extenders provides the ability to connect up to four UHD 4K sources to four UHD 4K HDMI displays and freely switch between them.